Reading and share top 10 famous quotes and sayings about Apple Company by famous authors and people. Browse top 10 famous quotes and sayings about Apple Company by most favorite authors. 1. "No company should depend on one person no matter how that person is smart or genius, whether it's Apple or News Corp, or Citibank or any other company in the world." 2. "The Macintosh having shipped, his next agenda was to turn the rest of Apple into the Mac group. He had perceived the rest of Apple wasn't as creative or motivated as the Mac team, and what you need to take over the company are managers, not innovators or technical people." 3. "Why does an iPhone cost only a couple hundred dollars? Because, as the stage performer Mike Daisey depicted in an arresting one-man show called 'The Agony and Ecstasy of Steve Jobs,' Apple's shiniest products are made by a shadowy company in China called Foxconn." 4. "Facebook, Google, Apple, Yahoo - there's a common theme. None of these companies ever sold. By staying independent, they were able to build a great company." 5. "I think Apple is a great device company." 6. "People have asked me, 'Is it about Apple or is it about Jobs?' and I say it's about how a man becomes his company and the company becomes the man. That has only happened a few times, like it happened with Ford, I think, they became inextricably linked together." 7. "Nowadays sound embarrassing. 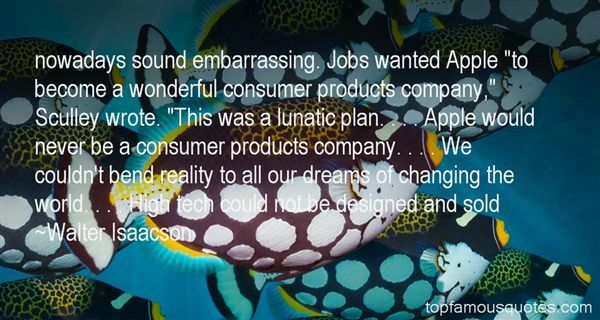 Jobs wanted Apple "to become a wonderful consumer products company," Sculley wrote. "This was a lunatic plan. . . . Apple would never be a consumer products company. . . . We couldn't bend reality to all our dreams of changing the world. . . . High tech could not be designed and sold"
8. 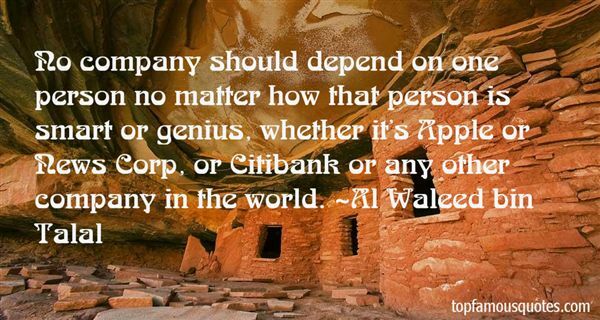 "One of his motivating passions was to build a lasting company. At age twelve, when he got a summer job at Hewlett-Packard, he learned that a properly run company could spawn innovation far more than any single creative individual. " I discovered that the best innovation is sometimes the company, the way you organize a company," he recalled." The whole notion of how you build a company is fascinating. When i got the chance to come back to Apple, I realized that I would be useless without the company, and that's why I decided to stay and rebuild it." 9. "The key venue for freewheeling discourse was the Monday morning executive team gathering, which started at 9 and went for three or four hours. The focus was always on the future: What should each product do next? What new things should be developed? Jobs used the meeting to enforce a sense of shared mission at Apple. This served to centralize control, which made the company seem as tightly integrated as a good Apple product, and prevented the struggles between divisions that plagued decentralized companies." 10. "The Apple Marketing Philosophy" that stressed three points. The first was empathy, an intimate connection with the feelings of the customer: "We will truly understand their needs better than any other company." The second was focus: "In order to do a good job of those things that we decide to do, we must eliminate all of the unimportant opportunities." The third and equally important principle, awkwardly named, was impute. It emphasized that people form an opinion about a company or product based on the signals that it conveys. "People DO judge a book by its cover," he wrote. "We may have the best product, the highest quality, the most useful software etc. ; if we present them in a slipshod manner, they will be perceived as slipshod; if we present them in a creative, professional manner, we will impute the desired qualities." As kids, we traded 'I like Ike' and 'All the way with Adlai' buttons in elementary school."